I'm a highly qualified marketing communications / technical editor, author, proofreader, layout artist, and publisher who has been engaged in the medical device, medical imaging, information security (infosec), and B2B/B2C realms for over 25 years. I've worked for companies large (HP) and small (Eigen), both as an employee and a contractor. My titles have included managing editor, marketing director, senior technical writer, contributing author, instructor, seminar speaker, webmaster, blogger, desktop publisher, computer VAR owner, publishers representative, prepress technician, and radio broadcaster. All of this experience equates to my likely having a unique insight regarding your business communications needs. But my being able to consider it from the point of view of your prospects, clients, and/or readers is of even greater value to your enterprise. I've massaged any number of topics— from medical devices and imaging to internet cloud security, oil & gas exploration to the global paint & coatings industry, municipal water / wastewater controls to electricity markets, and from software to PCs and peripherals. Did I mention general business marketing, branding, and manufacturing? Within 30 days of joining the Editorial Freelancers Association I landed my first ongoing client—after having been chosen from a pool of 68 EFA respondents and winning a semi-finalist editing shoot-out. Other companies have since joined my roster of regulars. Some find me through my EFA profile, read my extensive LinkedIn profile, then follow up with a short phone interview. Upon request I visit regional clients in person. Backstory—Having the Renaissance mind of an engineer, author, and artist, I follow in the footsteps of my forebears as an autodidact (an inherent family trait). I was tinkering with movable type when I was in short pants. In elementary school I was writing business letters to agencies such as J. Walter Thompson—and getting results. In AP English I got an A+ on my term paper about Sir Francis Bacon and the scientific method. Regarding thesis flow and organization, my teacher wrote on its cover page, "You have the mind of a lawyer." That and the grade were the only markings she had to make. Years later, publishers and marketing chieftains have repeatedly told me they love my submissions, as they can "publish them verbatim" — eliminating the need for more editing. In the mid-'80s I was a very early adopter of desktop publishing, intently studying typography and page layout (e.g., Roger Parker's Looking Good In Print). Soon I was both an Aldus PageMaker and AutoCAD reseller, in addition to moonlighting as a vocational school desktop publishing (DTP) instructor. During this period I won two regional marketing awards while promoting my business via direct mail collateral and a B2B magazine. My byline and cover stories have appeared in several periodicals. Being an active member of its Windows and DOS beta testing programs in the late '80s, Microsoft chose me from a pool of 8,000 candidates to be a technical editor for three of its user guides, with over 100 of my edits being published in its Windows 3.1 manuals. And Que Corporation selected me as a technical editor for its book about CorelDRAW!, the popular vector graphics software that competes with Adobe Illustrator. Through the '90s I criss-crossed the US several times while leading IT classes and seminars for Fortune 1000 and governmental employees. Beyond the numerous public events, this included solo onsites for Boeing, Exxon-Mobil, Dow Chemical, Sprint, Nortel—and even Navajo Indian Health Services in Window Rock, AZ. That led to another engagement at an annual U.S. Coast Guard computer security conference. Professionally trained as a broadcaster, I began my career as a radio advertising salesperson / copywriter / producer. One quickly learns how to compress an effective sales message into 30 seconds, without sounding hyperventilated. Within two years I switched to newspapers and trade magazines, with titles ranging from The Detroit News to Great Lakes/Seaway Review. I've moonlighted in Webb offset prepress operations, dealing with impositions, Rubylith, color overlays, and screens while stripping negatives. I've frequently leveraged that experience as a commercial printing liaison for the professional works I've created. Several organizations had me speak about DTP, including the Michigan Assn. of Governmental Computer Users. And I was a two-time panelist at West Michigan Electronic Publishing Expo events. A handbill I designed in '68 for a B.B. 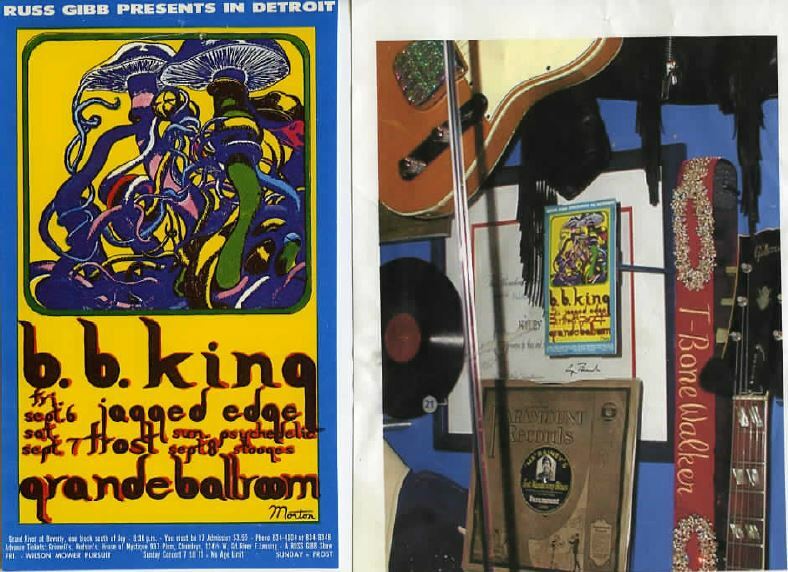 King concert at Detroit's Grande Ballroom appeared 36 years later in a Rock 'n' Roll Hall of Fame & Museum exhibit. Soon afterward it got fly-by treatment in Louder Than Love: The Grande Ballroom Story, a DVD. The private secondary school I attended held a Be-In that same year. I presented a shadow show while the incomparable MC5 (credited with being the progenitors of punk rock) "kicked out the jams" next to me onstage. As its author, an article about freeform Detroit radio in the late '60s appears in Heaven Was Detroit—From Jazz to Hip-Hop and Beyond. It features the late, great Dave Dixon of WABX (the original Air Ace) and appears alongside submissions by noted critics Lester ("Almost Famous") Bangs, Ben Edmonds, Dave Marsh, Greil Marcus, and Susan Whitall.